Purple is trending this year for fall weddings. 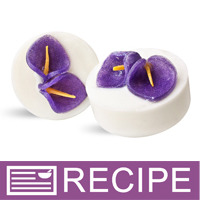 These purple calla lilies look beautiful on top of this creamy white soap "cake". To Make Pistons: Melt .5 oz. of clear soap in a plastic beaker. Add slivers of yellow color cube until deep yellow color is achieved. Pour into one cavity of the round soap mold. To Make Lilies: Melt 1.5 oz. of clear soap. Add 1 teaspoon of liquid glycerin and about 1/2 tsp. of Purple Glitter. Add a little more if darker color is desired. Place small heart soap mold on a cookie sheet. This will give the mold stability if it needs to be moved. Stir soap right before pouring into soap mold to keep glitter suspended. Pour just enough soap to cover bottom of each heart cavity. When finished, spritz top of soap with rubbing alcohol. When soap has set up, remove yellow circle and all 12 purple hearts. Cut yellow circle in fourths. Using soap cutter, slice thin pistons at an angle so one end is a point. Make enough for 24 calla lilies. Set aside. With point of heart facing up, fold sides of heart into the middle. Continue until all 12 hearts are folded. Melt 1 oz. of clear soap in a beaker. This will be the "glue" to hold the calla lily together. Place one piston inside a lily and press together. Try to keep piston sticking up as much as possible. Using a small paint brush, paint some clear soap into the middle of the flower and hold together until soap sets up. Add more soap if needed. Continue until all twelve lilies are finished. Cut any excess yellow piston off the end so it is even with lily. Set aside. Weigh 28 oz. of goat milk soap. Cut up into chunks and place in large glass measuring cup. Melt in microwave until completely melted. To melted soap, add 0.85 oz. of Calla Lily fragrance oil. Stir well to incorporate. Pour soap into all 6 soap cavities. Spritz tops with rubbing alcohol. When soap begins to thicken, place one lily on top of soap. If lily stays in place and does not sink, soap is ready. Taking 2 lilies, spritz bottoms with alcohol and top of white soap. Using a toothpick, poke a few holes into the soap, releasing some melted soap. Position 2 lilies on top so melted soap acts as a glue to hold them in place. Continue until all 6 soaps have been made. Set aside. Repeat above steps to make remaining 6 soaps. Omit Steps 2 through 6. Enough pistons were made for all 12 soaps. Package Suggestion: Place a cello bag flat on table. Using a small piece of cardboard, place soap on top and slide into bag. Remove cardboard. This will help keep soap marks off the cello bag. Tie with purple ribbon. Add tag with couples name and wedding date.